The actor finally back to Indonesia after his first visit back in 2007 for ‘My Girl’ promotion. When we talk about Lee Dong Wook, we can’t forget his act in tvN’s ‘Goblin’ as Grim Reaper. As to this, he curiously asked whether in Indonesia there’s a thing called grim reaper. The MC then taught him the Bahasa version of it “Malaikat Maut” and he perfectly pronounced it well. In this section, we’re also showed the top 3 best ‘Goblin’ scene chosen by fans. Of course the top one should be the video call scene which brings laughter to viewers. “In every country that I went, this scene always come up! Do you like it very much? I am glad haha. During the filming, all the staffs are laughing at me. I look like a dumb person and I even questioning my self, what am I doing?” Different from fans, Lee Dong Wook personally chose the scene where Wang Yeo burnt his belonging as his fave. He shared that while acting as Wang Yeo, he also felt the pain as he’s into the character that much. Other than Grim Reaper, Lee Dong Wook once act as ‘Blade Man’ which also use a lot of CG in it. “At first I doubt it could be done. But I love the message in the drama. i’m so tired while filming, I ran and climbed for real!”. After the long-but-short QnA section, the next session brings fans to get closer with Lee Dong Wook even more. Lee Dong Wook enter the venue from the backside, walking around and greet fans from the back. Starting from re-enacting the drama scene with the actor, granting wishes, guess the gesture games, and parody contest. Some of lucky fans can’t hide their excitement and nervousness on stage as they got to see their idol up close and personal. During this session, we got to know that Lee Dong Wook is indeed loved by fans from any age, once we got his fans from 10 years ago, yet we got his fan who’s 13 years old! Lee Dong Wook him self also amazed by fans’ effort to make the parody. He really can’t stop laughing and starring on screen to watch it. The best parody was able the ha a short romantic date with Lee Dong Wook. From this section the actor shared that he’s not a selca person “It’s okay if my phone doesn’t have camera,” also he’s a cinema-date person. Wrapping up the session, a group selca is a must. But then, a surprise video played from fans around the world, gathered by Indonesia fans, showing their endless support for the actor, and wishing him to go another successful path. 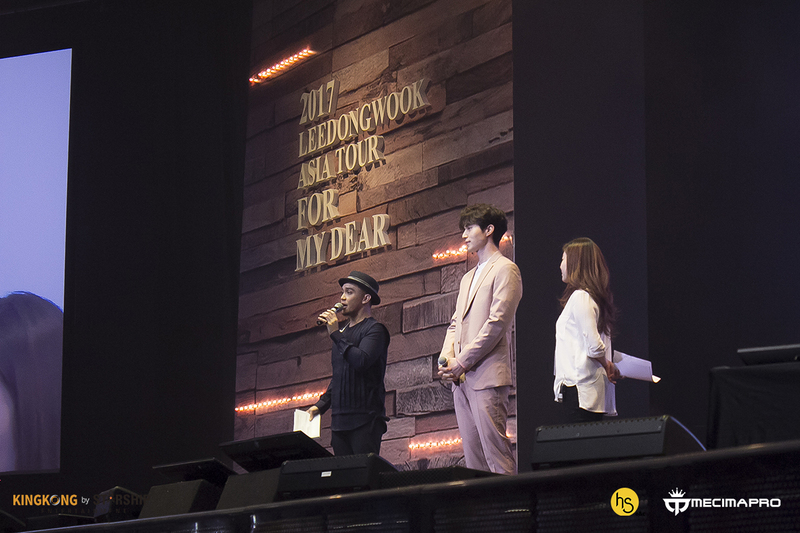 As the show comes to and end, Lee Dong Wook wrapped up the night with a song and hopes to come back to Indonesia again. “I promise it won’t be 10 years long! Maybe next year? I hope you still support me just as you support me as Grim Reaper.” The show officially ends with a hi-touch section for every fans attending the event. We would like to send our thanks to Mecima Pro for inviting us to this another-great event and we can not wait for the next event from Mecima Pro!